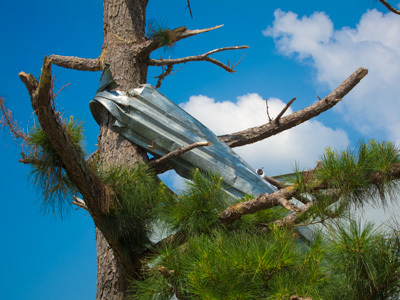 A highway guard rail wrapped around a pine tree in Hackleburg, Alabama after it was hurled by an EF-5 tornado on April 27, 2011. Hackleburg, Alabama, July 19, 2011, 2:11 p.m., Canon PowerShot S95, f/4.9, 1/500 sec., ISO 80. Photo by Christopher Mardorf / FEMA. Books, tables and file cabinets litter a classroom after an EF-5 tornado struck Hackleburg High School on April 27, 2011. Hackleburg, Alabama, July 28, 2011, 11:16 a.m., Canon 5D Mark II, EF 24-105 mm f4.0L IS USM, f/22, 1/125 sec., ISO 800. Photo by Christopher Mardorf / FEMA. Under an exposed roof and mangled truss, insulation and debris litter a high school classroom destroyed by an EF-5 tornado on April 27, 2011. Hackleburg, Alabama, July 28, 2011, 11:43 a.m., Canon 5D Mark II, EF 24-105 mm f4.0L IS USM, f/18, 1/125 sec., ISO 400. Photo by Christopher Mardorf / FEMA. Debris, wiring, insulation and an office chair littler a room at Hackleburg High School struck by an EF-5 tornado on April 27, 2011. Hackleburg, Alabama, July 28, 2011, 11:24 a.m., Canon 5D Mark II, EF 24-105 mm f4.0L IS USM, f/7.1, 1/125 sec., ISO 400. Photo by Christopher Mardorf / FEMA. Chairs, tables, books and insulation litter a classroom after an EF-5 tornado struck Hackleburg High School on April 27, 2011. Hackleburg, Alabama, July 28, 2011, 11:19 a.m., Canon 5D Mark II, EF 24-105 mm f4.0L IS USM, f/22, 1/125 sec., ISO 400. Photo by Christopher Mardorf / FEMA. The twisted, skeletal remains of a blue jeans factory destroyed by an EF-5 tornado that struck the Wrangler Distribution Center on April 27, 2011. Hackleburg, Alabama, July 19, 2011, 1:16 p.m., Canon PowerShot S95, f/4.9, 1/500 sec., ISO 80. Photo by Christopher Mardorf / FEMA. The twisted metal infrastructure of a blue jeans factory destroyed by an EF-5 tornado that struck the Wrangler Distribution Center on April 27, 2011. Hackleburg, Alabama, July 19, 2011, 1:30 p.m., Canon PowerShot S95, f/4.9, 1/320 sec., ISO 80. Photo by Christopher Mardorf / FEMA. Concrete blocks, chairs and tables litter a classroom after an EF-5 tornado struck Hackleburg High School on April 27, 2011. Hackleburg, Alabama, July 28, 2011, 11:15 a.m., Canon 5D Mark II, EF 24-105 mm f4.0L IS USM, f/22, 1/125 sec., ISO 800. Photo by Christopher Mardorf / FEMA. A highway guard rail stuck in the upper branches of a pine tree in Hackleburg, Alabama after it was hurled by an EF-5 tornado on April 27, 2011. Hackleburg, Alabama, July 19, 2011, 2:14 p.m., Canon PowerShot S95, f/4.9, 1/200 sec., ISO 80. Photo by Christopher Mardorf / FEMA. Cinder blocks, insulation and debris litter a hallway after an EF-5 tornado struck Hackleburg High School on April 27, 2011. Hackleburg, Alabama, July 28, 2011, 11:15 a.m., Canon 5D Mark II, EF 24-105 mm f4.0L IS USM, f/22, 1/125 sec., ISO 800. Photo by Christopher Mardorf / FEMA. Insulation and structural debris litter a hallway after an EF-15 tornado struck Hackleburg High School on April 27, 2011. Hackleburg, Alabama, July 28, 2011, 11:23 a.m., Canon 5D Mark II, EF 24-105 mm f4.0L IS USM, f/18, 1/125 sec., ISO 400. Photo by Christopher Mardorf / FEMA. The flattened remains of a high school auditorium destroyed by an EF-5 tornado that struck Hackleburg High School on April 27, 2011. Hackleburg, Alabama, July 28, 2011, 11:27 a.m., Canon 5D Mark II, EF 24-105 mm f4.0L IS USM, f/22, 1/125 sec., ISO 400. Photo by Christopher Mardorf / FEMA. The collapsed wall of a school room destroyed by an EF-5 tornado that struck Hackleburg Middle School on April 27, 2011. Hackleburg, Alabama, July 28, 2011, 11:40 a.m., Canon 5D Mark II, EF 24-105 mm f4.0L IS USM, f/20, 1/125 sec., ISO 400. Photo by Christopher Mardorf / FEMA. The missing roof and collapsed wall of a school destroyed by an EF-5 tornado that struck Hackleburg Middle School on April 27, 2011Hackleburg, Alabama, July 28, 2011, 12:19 p.m., Canon 5D Mark II, EF 24-105 mm f4.0L IS USM, f/14, 1/400 sec., ISO 400. Photo by Christopher Mardorf / FEMA. Concrete and twisted steel litter the site of a blue jeans factory destroyed by an EF-5 tornado that struck the Wrangler Distribution Center on April 27, 2011. Hackleburg, Alabama, July 19, 2011, 1:29 p.m., Canon PowerShot S95, f/4.9, 1/500 sec., ISO 80. Photo by Christopher Mardorf / FEMA. The collapsed and twisted infrastructure of a blue jeans factory destroyed by an EF-5 tornado that struck the Wrangler Distribution Center on April 27, 2011. Hackleburg, Alabama, July 19, 2011, 1:16 p.m., Canon PowerShot S95, f/4.9, 1/500 sec., ISO 80. Photo by Christopher Mardorf / FEMA. 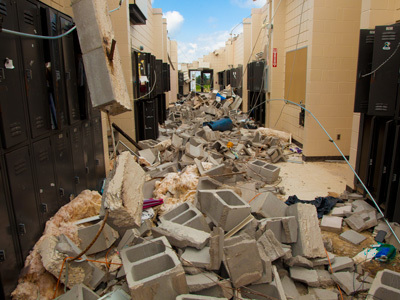 Cinder blocks, insulation and debris litter a hallway after an EF-5 tornado struck Hackleburg High School on April 27, 2011. Hackleburg, Alabama, July 28, 2011, 11:16 a.m., Canon 5D Mark II, EF 24-105 mm f4.0L IS USM, f/22, 1/125 sec., ISO 800. Photo by Christopher Mardorf / FEMA. One of two city water towers that were left standing after an EF-5 tornado struck Hackleburg, Alabama on April 27, 2011, and destroyed much of the town. Hackleburg, Alabama, July 28, 2011, 2:11 p.m., Canon PowerShot S95, f/4.5, 1/1000 sec., ISO 80. Photo by Christopher Mardorf / FEMA.